Obstacles to disruptive innovation in health care. 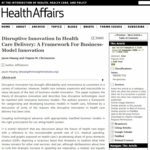 As promised, in part two of our three part series on 'disruptive innovation' in health care, we'll look at why disruptive innovation is so difficult in health care and the obstacles disruptive innovations might meet. With cost at the forefront of health policy discussions, a majority of health care stakeholders believe disruptive innovation will facilitate the transformation of the U.S. health care industry and finally get costs under control, according to a recent NEJM Catalyst survey—that is, only if low-cost alternative business models can overcome significant barriers. But health care has long been ripe for disruptive innovation. For decades, innovations in health care have been the sustaining kind—tools to help doctors solve the most complex of cases, for example—which save lives but are unlikely to be needed by most and may increase the cost of care for every one. And while there's been some disruptive innovation, we haven't seen much true disruption—the point where low-cost alternatives can successfully meet the needs of a majority of health care consumers and thus force traditional business models out of the market. Is it only a matter of time? Will retail "minute clinics," for example, follow the well-observed trajectory of disruptive innovations and eventually take over the health care industry? Or are the barriers still too high for disruptive innovations to make waves in health care? 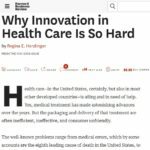 We'll try to answer these questions next time, but first, let's look at what, exactly, those barriers are, and why disruptive innovations have had a hard time gaining traction in the U.S. health care system. So, why haven't we seen much disruption? Disruptive innovations are fundamentally low-cost alternatives, and therein lie the obstacles—and controversy. Writing in 2000, Christensen and colleagues Richard MJ Bohmer and John Kenagy described "powerful institutional forces," that fight low-cost alternatives to the status quo. "And those opponents to low-cost change are usually lined up three or four deep," they write. Afraid of putting patients at risk, or losing livelihoods, or losing revenue, regulators, professionals and hospitals all might balk at low-cost alternatives. Some motives are admirable, if misguided, and some are decidedly self-interested but justifiable—these obstacles are rational, complex and controversial. The sheer number of stakeholders in the health care industry only adds complexity to these issues. And the myriad stakeholders each have changing and competing agendas, says Harvard Business School professor Regina E. Herzlinger in the Harvard Business Review in 2006. "The competing interests of the different groups aren't always clear or permanent," she writes. Medical specialists wage turf warfare for control of patient services, and insurers battle medical service and technology providers over which treatments and payments are acceptable. Inpatient hospitals and outpatient care providers vie for patients, while chains and independent organizations spar over market influence." And the list goes on—stakeholders with competing interests can spur innovation or make it exceedingly difficult, Herzlinger explains. "Often, these players have substantial resources and the power to influence public policy and opinion by attacking or helping the innovator," writes Herzlinger. Forces blocking disruptive innovation—forces that could support it. The fact that we haven't seen much disruptive innovation in health care means that these forces are working in concert with one another to prevent challenges to the status quo. 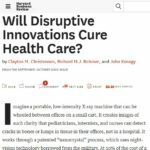 In other words, suggest Christensen and colleagues, health care is closed to market forces that facilitate disruptive innovation. The health care industry desperately needs to open its doors to market forces.... We're not talking about letting insurance companies micromanage doctors as they practice medicine or about putting profits above patient care. Rather, we're talking about being open to disruptive technologies and business models that may threaten the status quo, but will ultimately raise the quality of health care for everyone." But it's business model innovation, specifically, that could hold the key to greatly reducing the cost of health care. At least, that's what Christensen and Jason Hwang, MD argued in 2008—that technology could "deliver tremendous value" only when embedded within "disruptive business models," so let's expand there. What did they describe as the challenges to new business models in health care? Health information technology is critically important to innovation. Consumers should make rational purchasing decisions to allow market forces to work. Regulations trap health care in high-cost models of care. Cutting reimbursement rates actually prevents disruptive innovation, rather than promoting it. Fragmentation of care is straightforward—electronic and personal health care records need to be sophisticated enough to facilitate a connection of health records despite a fragmentation of care providers that would likely result from disruptive innovation. Lack of a retail market is a particular challenge. "Disruptive innovation requires that a market of consumers carry proper incentives to shop for products and services that best meet their needs," write Hwang and Christensen. We've found our way back to the market forces argument—disruptive innovation is necessarily a market force, and markets need consumers to act like consumers—rationally shopping for what meets their needs at the lowest price. Regulatory barriers are a different kettle of fish, though they look a lot like the motives of the players we first discussed, (because the players were likely involved in the establishment of the regulations in the first place). Some are just outdated; some are admirable, if misguided; some are justifiable, though self-interested—rational, complex and controversial political. It is a mistake to focus only on cutting costs when trying to fix the health care system... regulators and payers often direct their attention to cutting reimbursement rates as the primary solution. However, cutting reimbursement in an attempt to force the [high-cost] business models of hospitals and physician practices to somehow figure out a way to become more efficient does little to improve health care delivery. With lower reimbursement, hospitals and physicians struggle even more to fulfill their value propositions of providing complex, inherently expensive medical care, and they become even less inclined to hand off work to [low-cost] process businesses." In the above, I've bracketed out references to particular business models for which I haven't provided context. But the argument is still clear—let's look closely at this paragraph. In this blog and the previous, I've couched disruptive innovation in terms of cost—it is inherently a cost solution—but in unpacking the obstacles to disruptive innovation, it becomes clear that simply forcing providers to do more with less won't do anything to overcome the obstacles to innovation. In fact, forcing doctors and hospitals to do more with less pushes them to compete for more consumers with less demanding needs to maintain revenues. This competitive "efficiency" creates situations where doctors spend only a few short minutes with a patient, and medical error becomes more likely. Plus, they're taking that business away from a disruptive innovation which may be able to meet that consumer's needs at a lower price. That's a lose-lose for every one. There will always be a need for the high-cost doctor and hospital model—unlike in other industries, it is unlikely that disruption would truly render the traditional way of doing business obsolete. We'll always need doctors and hospitals to provide "complex, inherently expensive care." But if a significant portion of health care consumers don't need that inherently expensive care, we NEED disruption that can turn lose-lose realities into win-win solutions. If the health care industry is to get serious about driving down costs, these barriers need to be overcome—in some ways, all at once. "It is important to recognize that the health care system comprises highly interdependent business models, and one cannot simply plug in a new component and expect it to work," write Hwang and Christensen. And tackling multiple issues at once means that stakeholders and decision-makers need to reach meaningful consensus. Change requires real collaboration. Herzlinger suggests that the six forces blocking innovation can also be harnessed in support of disruptive innovation. With players, for example, that means every one needs to be at the table to discuss what's in the best interest of patients—allowing disruptive innovation to occur. That's not to say the industry should be de-regulated aggressively, but rather that the players, policy-makers, regulators, funding and accountability groups and innovators need to work together to find ways to allow disruptive innovation to challenge the high cost status quo. The players wield a great deal of influence and are strongly motivated to maintain their own interests, meaning collaborative efforts will likely have the exceptionally difficult task of finding win-win solutions and compromises with the best interests of consumers at their heart. But I believe, perhaps optimistically, that those solutions exist—that collaboration can work. Here's why. They're making progress in Louisville, and groups like this one could wield enough influence to reach consensus on issues preventing disruptive innovation from occurring, lower those barriers, and share their results with other groups. Of course, we have our own experience with collaboration. Recently, the Health Professions Network worked collaboratively to produce comprehensive basic competencies for all clinical health care professionals. In our white paper on the topic, we discussed how competencies could make a real difference in health care, and even reach solutions that may lower the barriers to disruptive innovation. One of the first obstacles I mentioned in this article was the motive for health professionals to protect their livelihoods—and certainly, health professionals deserve to be compensated for their investment of time and money in education and training to achieve their career goals. We don't want to put any one out of work—and with competencies, we wouldn't have to. Competencies pave the road for solutions to systemic inefficiencies that make qualified, competent and capable health professionals afraid to lose their jobs. Take stackable credentials, for example, which could facilitate the lateral movement of competent health professionals. If a disruptive innovation threatens the scope of practice of a particular credentialed health professional, those professionals could more easily be expedited to education that qualifies them to work at the same level of expertise or competency in another area. Tackling issues behind closed doors without reaching consensus is unlikely to address more than one or two of the six forces Herzlinger describes—and it certainly won't address a majority of the players with separate and competing agendas. For disruptive innovation to work, health care needs to collaborate. And understanding the barriers described in this blog is a good place to start—understanding barriers to disruptive innovation allows us to identify areas where we can start talking and crafting consensus solutions. In part three of this blog series, we'll discuss trends that may push stakeholders in the U.S. health care system to come to the table and collaborate on these issues—especially because many believe that disruptive innovation is the key to a better future for health care. Stepping away from the issues facing health care as a whole, we want to remind you about the Health Professions Network Association Summit in Chicago, July 26-27. This event will be a rapid fire brainstorming session on issues facing associations of non-physician health professionals, issues like: apathy inside & out of the organization, limitations to volunteerism, licensing board consolidation, advocacy on a federal level, generational differences & millennials, and much more. It's possible we'll be coming up with some disruptive innovations of our own—or reaching consensus on areas we can work together to better support all of our members' interests. This truly is a unique opportunity to get together with your colleagues and learn—in a meaningful way—what's working, not working, what might work for you. We don't learn from lectures—we learn by talking and doing with like-minded peers monitoring the same issues and tackling the same problems. "It's also a unique opportunity to find common ground—how can associations in non-physician professions work together on issues affecting all of us? What could be do, together, in the advocacy space? In dealing with regulatory reform? In dealing with the elimination of licensing barriers, or the consolidation of licensing boards? I think we'll find out in Chicago." I want to remind you that this is also a limited opportunity. Honestly—we just don't have the resources to hold a summit every year. So we're asking you to join us this time, this year—because we don't know if the next opportunity might be too late. We're a little over one month out, now, but we worked hard to find that time that should work around your busy conference schedules. We've gotten a number of confirmations already—from our members and contacts at other health care professional associations with whom we've been discussing these issues—we're all excited to hit the ground running. Don't wait on this—we want you to be there.